A Wallaby of my own. I'll be documenting this one here. Hope you enjoy. Pete (Metalmad) did a full blow by blow at the other place and made a great running engine,,,,hence my name...of my own. I will be using Bez's castings...they seem well enough...I'm sure they'll be great as one running engine is out there made from them. I started this at the other site as a "interactive" thread. That didn't seem to catch on well, ....so although I don't mind input on different ways of doing things....feel free to.....I won't be making it a focus like I did there. Instead I'll work with the equipment I have and post it blow by blow. My son is going to be working with me and at the age of 9 is quite young...but he's enthusiastic. Don't expect any speed records here...... I'm a busy guy. Re: A Wallaby of my own. I've got engines I started years ago, and they still aren't finished, you just take as long as you want. Just make sure that little one gets a good grounding in machining, he's the future. Just post things up; I'm sure people will ask if they've got questions! Howdy Dave, fancy meeting you here - I guess I'll be following this thread here then. Never look up at the mountain - just keep digging ! No hurry. I think this place is going to be around for awhile, now that we have a full complement of smileys. Im still dealing with the fallout of the other.....but im on it! GA showing the basic layout of the engine.....notice the oil pump in the bottom right hand side....think about the datums involved.....nasty bit that is. As for progress...you won't be in last place. Even if you run past tel. Thanks for the support all... I'll post some more. I happy to have found your Wallaby build here. Will be following. Next is the gears for the crank, idler, cam shaft and pump. I plan on using a different method that was used recently by Arnold. I'll be using a flycutter and making the flycutter per a method put forth in a spreadsheet format by Gail Graham (GailNM). 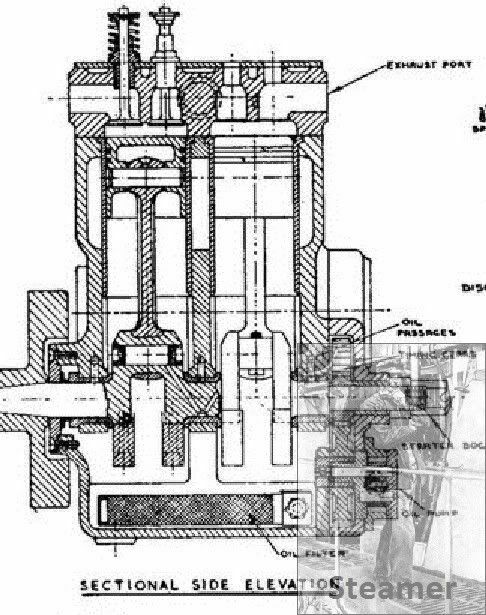 Because of the make up of three castings in the gear locations, I believe I will need the gears to find the true locations of the pump, cam ect..in situ. That's my plan and I'm sticking to it! tel - i got you beat by a mile, i started building a george white traction engine at the age of 12 and i am now ............ er.............well .......... a bit older .............. aw hell i am 44 and it is still not even close to being done. Bad Behavior has blocked 13124 access attempts in the last 7 days.